Originally published on blogger.com on August 2, 2005. It was September 10, 2001; the eve of the first terrorist attack on America. I had long hair and was a regular attendee of Eddie’s Attic, usually 3-4 nights a week. I had managed to overhear that John Mayer (who was just on the verge of celebrity, but still a local musician) was performing a private gig for close friends and family. My friends at the Attic got me in to see the show. The next morning I awoke around 9AM. I checked my phone messages only to hear the two most incredible messages of all time. First, came the message from Barnes. AGHGHGHGH! I had totally slept through it! I missed a chance to be on the radio. This would have been huge. After all, it had only been 4 months since I quit my job to become a full time songwriter. This was my chance to be heard by the world. Or at least Metro Atlanta. What!? There was my mom overexaggerating some story again, waking me up too early. I couldn’t have even imagined what I was about to discover when I turned on the news. I saw the second plane hit. I felt desperation and rage all at once. I was stunned, paralyzed, mouth gaping, motionless on the edge of the couch. Disbelief. Vulernability. 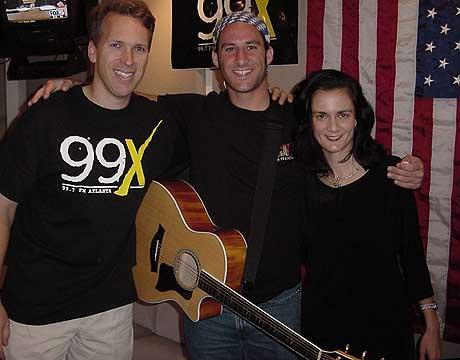 The morning arrived for “My Big Break.” I rose early, warmed up my vocals and made my way to 99X. It was all very exciting as I felt privileged to see the inner working of such a popular radio station, much less to share one of my original songs with my hometown. I played “Aimless” and did a brief interview with Barnes and Leslie. Jimmy Barron was absent that day. Leslie asked me how committed I was to this life of an independent musician. I told her that someone once told me “it takes 10 years to become an overnight success” and that’s what i would give it. The feedback was immediate and large. There were many phone calls to the station and I got to talk to lots of cool folks. My email was flooded when I got home with congratulations from friends and family and praise from total strangers. I even had an email from an A & R rep with Warner Bros. Nothing ever came of it, though. I had taken a huge step forward, but I was still very green as a songwriter/performer. In many ways, I still am.